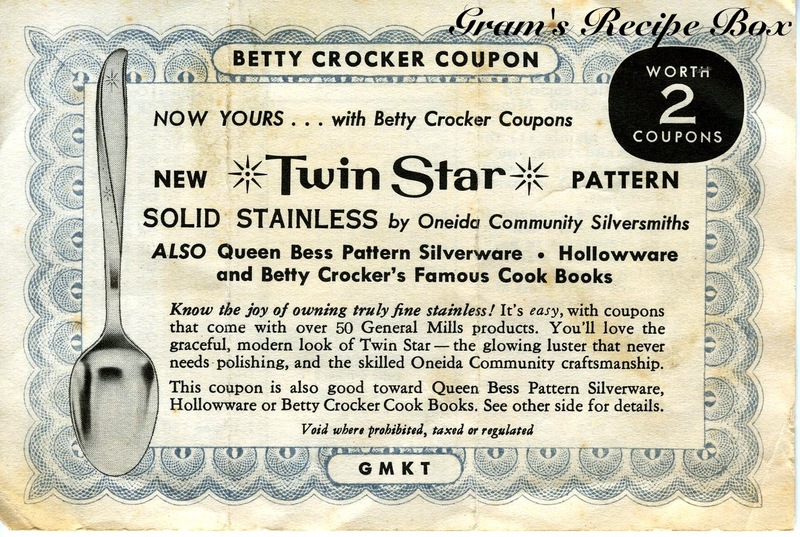 Back in the day merchants and manufacturers gave out coupon incentives to housewives to encourage brand loyalty (and of course they still do today). These particular ones from General Mills were part of the Gold Medal flour package. 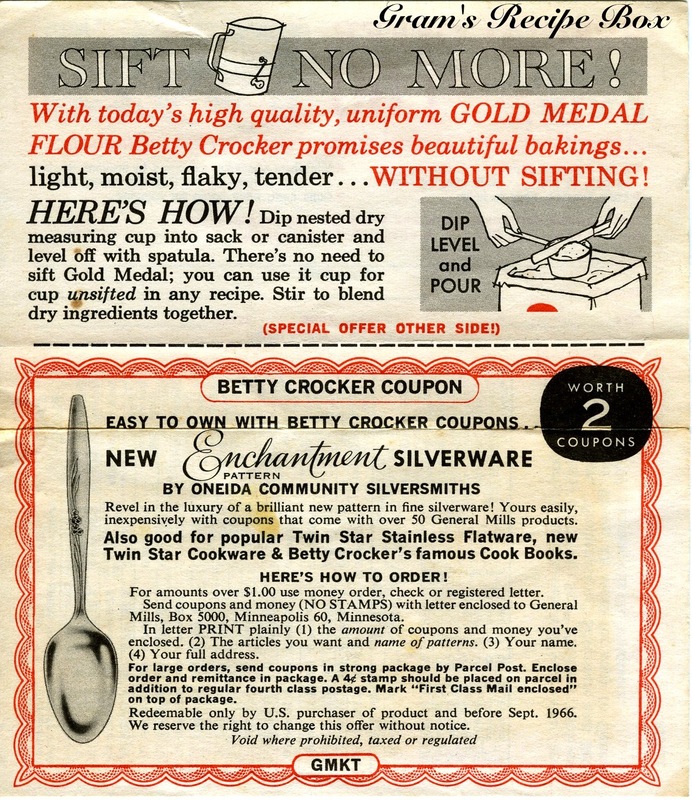 A 5 pound bag included a Betty Crocker coupon worth 2 coupons, and a 10 pound bag included a 4x value coupon. 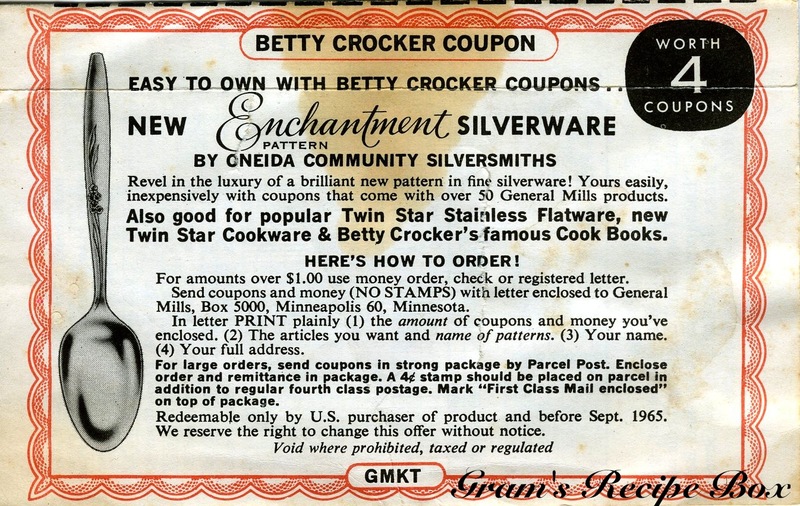 The coupons could be redeemed for a variety of household items, but around 1965 Betty Crocker and General Mills were pushing silverware by Oneida Community Silversmiths. Take a look at the order form on the back. Pick out the fork, knife or spoon (individual item, mind you) and enclose ten cents and 70+ coupons or 45 cents and 3 coupons. 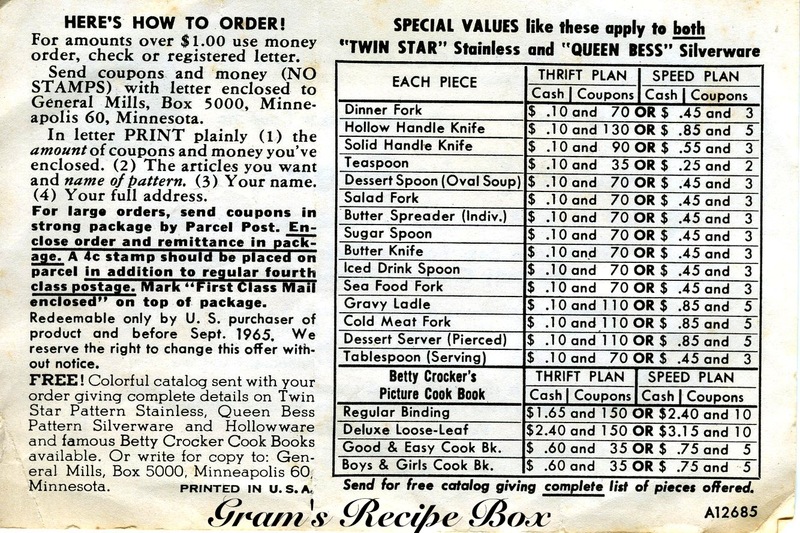 Now I understand that times were different in 1965 but seriously, 70 coupons? The 5 pound bag only gave you 2 coupons and a 10 pound bag gave you 4. You would need to purchase as many as 45 bags of flour before you could get one fork. Granted, the coupons came with around 50 other General Mills items, but holy moly! I can guarantee I would have been saving up the 45 cents as fast as possible to get my fork. Over the next few days I will feature some of the recipes that also were included with the bags of flour, and one of them I am positive that site regular Diane B’s mother used to make and we would have them after school. So prepare yourself for a walk through pie, cake and cookie recipes from 1965! Great images. Those clever ad-men, lol. My uncle was telling me how his mother would choose the brand of flour they would buy based on the fabric pattern of the cloth bags. She would make aprons and kitchen towels from the bags. There’s an old idea that could be ready to make new again…..
I’m sure we used LOTS of these recipes for after school treats. Now my mouth is watering…which yummy goody was it?